MessyJesse - a quilt blog by Jessie Fincham: 1st Quilt Finished! I finally got round to photographing my 1st quilt. It's all finished up :) took me a little longer than I originally anticipated, but I guess I'll speed up with practise - hopefully! I'm kinda... happy with it, I don't think I basted it very well, I didn't tape the backing fabric down to pull it taught enough so it's ended up looking a bit puffy? (Lesson learned for next time!) I chose to hand quilt a simple border and machine quilt my sawtooth star centres; I'm sure you aren't supposed to mix and match quilting styles but I've done it anyway?! I then topped it off with some red binding to pull it all together. It's lovely, you've done an amazing job! The star blocks look fab! Is the flowery border fabric from moda 30's playtime?... I've bought the charm pack of it and can't wait to use it. A VERY beautiful first quilt! And I think it´s absolutely ok to mix hand and machine quilting. 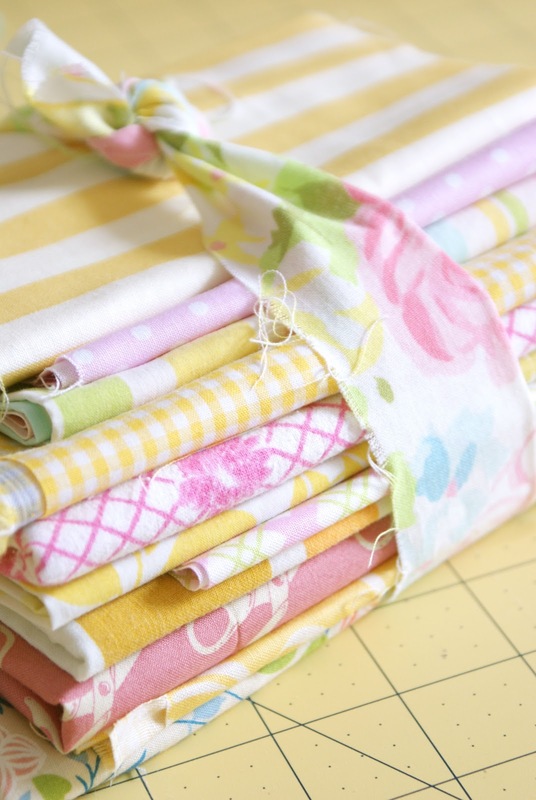 The fabrics for your next project are looking yummy, too! Love the first quilt! I've just completed mine. Going to slowly hand quilt when I can spare an hour a day. It's beautiful. 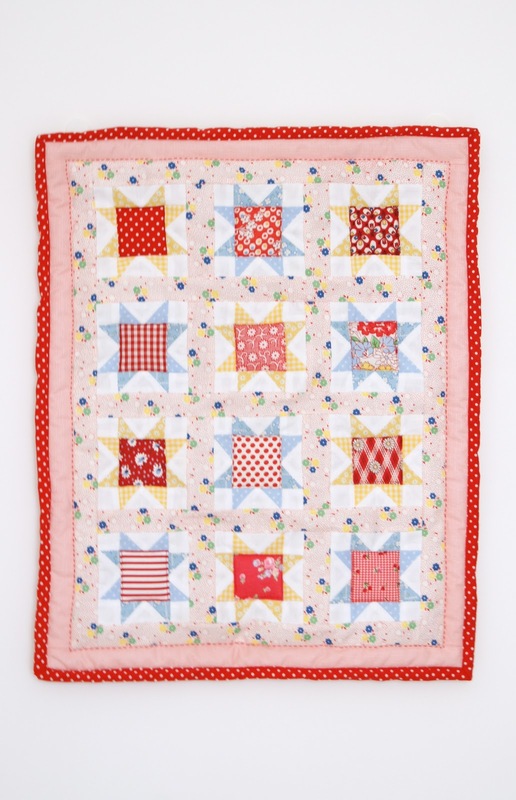 I love the red binding and the hand quilting, it looks great and really brings it all together. Well done, fabulous job! It's fantastic! And you can certainly do whatever you want with the quilting. Mixing it up makes for more visual interest. I'm excited to see what you do next! It's adorable!! Good job! I love your fabric choices! 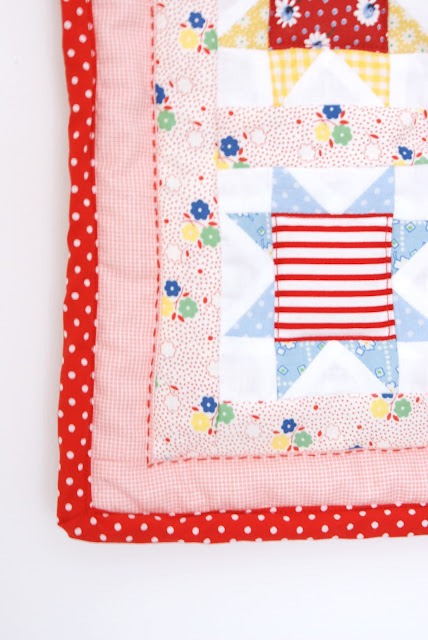 You can mix up the quilting if you want, it is YOUR quilt after all!! If this is your first quilt, I can't imagine how gorgeus will be the future ones! I think your hand stitch shows that it's an authentic handmade artwork :) I love it! The new fabrics you have choosen look very interesting, I'm impatient for see more! I love this quilt! So cheerful and lovely - very you! Gorgeous quilt! You've done a great job. The hand stitching looks great, I've not even tried that yet... must get on it! I think for a 1st quilt you did a great job. Yes you do get better with each stitch but most important is to always enjoy the process. You did a great job with your first quilt. Very nicely done. I mix up quilting styles sometimes, too. Remember there are no quilting police. i think it's so pretty! well done! Love your fabric choices! it's so cute! Beautiful quilt with great colors! Nice job! It looks great! And your first quilt?! Don't worry-there really aren't any quilting "rules". What a beautiful little quilt! Love the fabrics you have picked out for your next one!